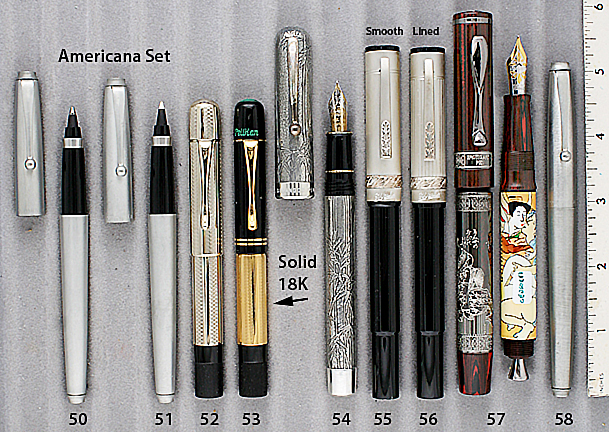 This is a 1976 Parker 75 Americana Pewter Ball Pen – Fibre-Tip (Rollerball) set – a limited edition of #5318/10000 in brushed Pewter. Comes in the red velvet lined, hinged, covered desk stand, replicating a colonial writing stand. Made to commemorate the 200th year of the declaration of US independence. In the cap tassie of both pens is a piece of wood from Independence Hall. The shape of the clip represents a bell clapper. Parker had famous silversmiths Reed & Barton (Mass.) hand-produce these writing stand replicas. Only a small number were made and they are very rare today. New-old-stock. Mint in original box with all original packaging. [Two available]. Close-up photo with packaging. The Fibre-Tip can be used with a roller-ball refill as well. Item #50 and 51 in Catalog #81. 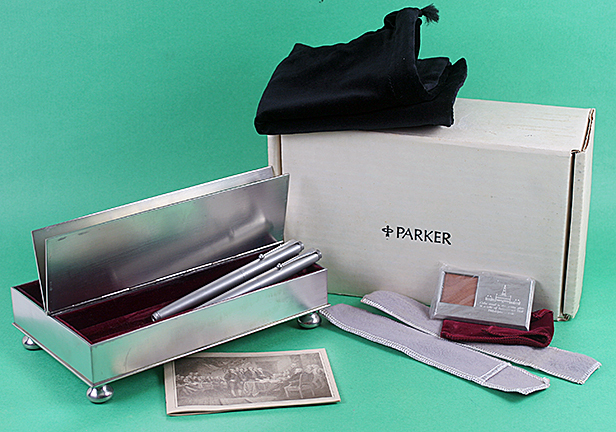 50 Parker 1976 Photo with Packaging.